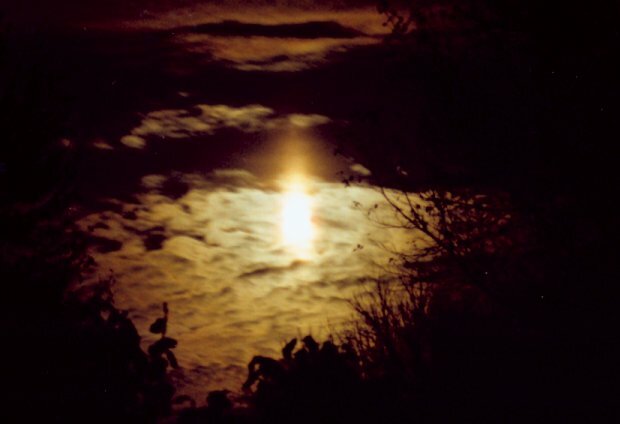 Photo of the Week.. A "moonpillar," caused by reflection of light from ice crystals in clouds, rises from the partially eclipsed Moon during the lunar eclipse of November 8, 2003. Astronomy news for the week starting Friday, December 12, 2003. As the week begins, the Moon wanes toward its last quarter, achieving the phase around noon on Tuesday, December 16, about the time it sets (though moonset in daytime is in practice nearly invisible). The night of Monday the 15th finds the near-quarter passing to the north of Jupiter, the two making a fine sight in the sky after midnight. Jupiter's brother planet, Saturn, was passed by the Moon last week, and is already up in the northeast by twilight's end. As good a sight as this pair is that of Venus, shining now gloriously in the southwestern evening twilight sky. Through the telescope, the planet appears in a gibbous phase, that is, we see mostly the daylight side, less of the nighttime. Not that it matters much, since Venus is perpetually surrounded by dense clouds that prevent our seeing any of the surface. What we know of it comes by means of radar, reflected radio waves. Climbing ever higher in the evening sky, Venus now sets about half an hour after the end of twilight. In between, Mars, very visible to the south, crosses the meridian. Though fading, the red planet, at magnitude 0, is still brighter than all but a tiny handful of stars that include Sirius, Canopus, and Alpha Centauri (the last two visible only from quite far south). Down and to the right of Venus, you might still try to see Mercury, always a difficult "find," as it is so close to the Sun that it is never seen in a darkened nighttime sky. At the other end of the Planetary System is Pluto, the smallest "planet" (if you wish to call it that), which passes conjunction with the Sun at the beginning of the week. Though bright Moonlight does get in the way, if you are up in the early morning hours you might look for some Geminid meteors, the shower peaking the morning of Sunday, the 14th. The leavings of a comet called Phaeton, the Geminids -- which seem to come out of the constellation Gemini -- are quite good, at their best typically yielding over a meteor per minute in a dark sky. Phaeton is curious. Once thought to be an asteroid, it was found to have the same orbit as the Geminid shower, and is now considered a dead comet, its volatiles (which would ordinarily make a tail under the action of sunlight) either mostly boiled off or crusted over. The two stars on the eastern side of the Great Square of Pegasus point southward to Deneb Kaitos in Cetus, and then equally farther south to Ankaa, the bright luminary of a deep southern modern constellation called Phoenix -- the "Phoenix" (the legendary Firebird) -- that might be seen gliding just above the southern horizon for those in mid-latitudes. In between Deneb Kaitos and Phoenix is very little except for the eastern extension of another modern constellation, Sculptor (the Sculptor's Studio). Far brighter are the stars of winter, Orion and its cohort, now rising in the east as twilight glimmers off to the west.